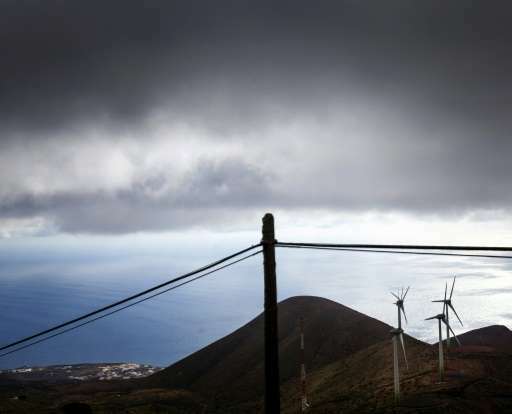 On February 15, this remote Spanish island of El Hierro nestled deep in the Atlantic off the coast of Africa managed to produced enough clean electricity for the 7,000 inhabitants for more than 24 hours. Pines and pineapples vie for space on El Hierro, a tiny rugged Canary island that has gone all out to produce all its electricity from renewables, attracting global attention in the process. On February 15, this remote Spanish island nestled deep in the Atlantic off the coast of Africa managed just that—for the first time, its hydro-wind plant produced enough electricity for the 7,000 inhabitants for more than 24 hours. With its rugged coastline of great black volcanic cliffs, badland moonscapes and ancient forests, the island, which is slightly smaller than Malta, is a UNESCO biosphere reserve, an area designated to promote its biodiversity and sustainable use. It has long dreamt of ending its reliance on diesel fuel, which is transported by boat from its bigger sister island of Tenerife to produce energy—after having been shipped in from further afield. 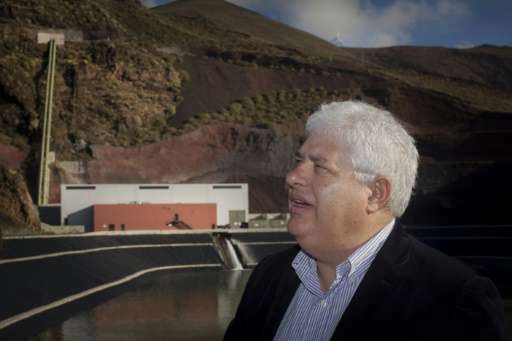 "To have total energy sovereignty... in an isolated territory is important," says Tomas Padron, the former chief of El Hierro and instigator of the project. So it was that in June 2014, authorities inaugurated the Gorona del Viento plant which combines five wind turbines planted on a hill with one water retention basin further up, and another further down. When the wind falls, water in the upper basin is released into the lower basin, passing through turbines which generate hydro power. This unique combination "is very promising" as it solves the problem that renewable energy production is intermittent, said Joelle Noailly, head of research at Switzerland's Centre for International Environmental Studies. Other European islands like Denmark's Samsoe and Eigg off the coast of Scotland are also trying to generate all of its energy needs through renewables, but their plants do not combine wind and hydraulic power. 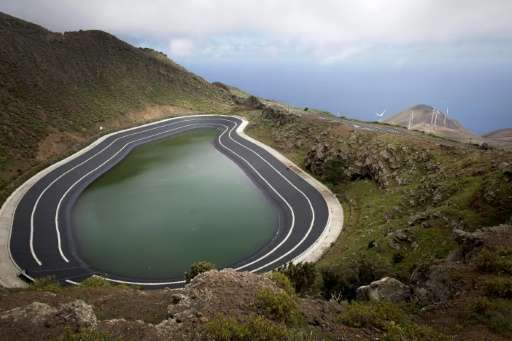 El Hierro's aim initially was to cover 100 percent of its electricity needs within a few months—an objective that has still not been achieved nearly two years on and Juan Pedro Sanchez, head of the Gorona del Viento plant, admits that the average is closer to 50 percent. And while Samsoe could be hooked up to the Danish electricity grid via an underground cable, the topography of El Hierro's seabed makes it impossible to connect to the Spanish grid. El Hierro's aim initially was to cover 100 percent of its electricity needs within a few months—an objective that has still not been achieved nearly two years on. Juan Pedro Sanchez, head of the Gorona del Viento plant, admits that the average is closer to 50 percent. "It takes time to get this type of plant going, it's never been done before," he says. Electricity grid operator REE, he says, still needs to be convinced that it can rely 100 percent on renewable energy for long periods of time. Wary of power outages, the company still prefers to produce electricity from fuel, according to Sanchez. And then the two water reservoirs are not big enough to produce "clean" electricity all year round, and there are no plans to build another. But despite these setbacks, the project has generated huge interest, particularly from fellow islands that are directly threatened by global warming. Apart from the thousands of tonnes of CO2 that have been prevented from weaving their way into the atmosphere thanks to Gorona del Viento, nearly 3,000 tonnes of fuel oil have been saved according to utility giant Endesa, which owns 23 percent of the plant. Representatives from the Seychelles, Indonesia, Japan, and Aruba in the Caribbean Sea have already come for a visit. "It is a workable model that can be replicated," says Emanuele Taibi, an analyst at the International Renewable Energy Agency. And apart from the thousands of tonnes of CO2 that have been prevented from weaving their way into the atmosphere thanks to Gorona del Viento, nearly 3,000 tonnes of fuel oil have been saved according to utility giant Endesa, which owns 23 percent of the plant. That represents 1.2 million euros ($1.4 million)... although residents have yet to feel the benefits. "The electricity bill has remained the same," says Claudia Barrera, an unemployed, 32-year-old secretary, as she eats breakfast in a cafe in Valverde, the island's diminutive capital which has no traffic lights. Belen Allende, the current chief of El Hierro's so-called "cabildo" or local administration, says this is down to Spanish legislation that does not allow its 17 semi-autonomous regions to fix their own electricity prices. She promises though that the money saved will go towards other projects. Apart from the obvious environmental benefits, the island wants to use its green image to attract tourists and scientists. A few thousand visitors tread El Hierro's shores every year—many of them nature-loving hikers or divers—compared to the five million or so who visit the better-known Tenerife annually. The plant itself has already attracted several thousand visitors—people who "eat, rent a car, a flat or a room," says Amos Lutzardo, head of the tourism centre of the island, where unemployment stands at around 27 percent. Xavier Verdaguer, a Spanish entrepreneur who lives in San Francisco, was part of a small group of 10 people who recently visited the site, snapping up pictures of the turbines and water reservoir. "We can see how an innovative project works," he said. And the cabildo wants to go further than just generating green electricity, with plans for a 100 percent "clean" island complete with electric cars and organic farming. "This is the backbone of our model of sustainability," said Allende. The initial investment can pay off almost forever. Once we learn to use our brains instead of our selfish emotions, we will have clean power. It looks like some folk here really do follow their selfish, ego-driven emotions. We can do this, even if we have to make upsets in the society to do it, like our other advances. The problem is to get the big mouth folk on the team actually DOING SOMETHING instead of just mouthing off. We have to work on efficiencies on the demand side, and not just build powerplants of one kind or another, but to find the correct ones to integrate into the needs and characteristics of the site.